Mayor Boris Johnson plans to confront President Obama over millions of pounds owed by the US embassy in congestion charges, during his visit to London. 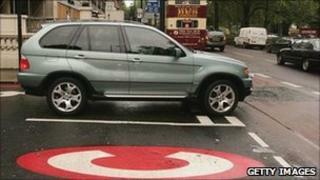 Several embassies refuse to pay the charge for driving in central London, claiming they are exempted from local taxes. The total bill stands at £51m. "Maybe when President Obama's hors d'oeuvre plate is whisked away he will find a bill for £5.5m," he said. The US embassy said it considered the charge to be a "direct tax". Mr Obama will visit the capital, from 24 to 26 May. Following Mr Johnson's interview on BBC London 94.9, Transport for London (TfL) confirmed the US embassy owed £5.2m in unpaid congestion charge. Speaking to Vanessa Feltz the mayor said he may be "shepherded away" from Mr Obama but added: "If I get the chance to I will remind him that the US owes us £5.5m in congestion charge. "I think if they are going to have the representation here in London then they should pay the charge for driving and using our streets. So 'No representation without a congestion charge' is the slogan." Several embassies refuse to pay the £10-a-day charge and the £120 fine incurred through not doing so. But Mr Johnson said: "It is not a tax, it is a charge for services and I think we should test this in the courts. "The only way we could do this is if the foreign office gets a grip on the situation and actually takes the American government to court and gets this adjudicated in the international court." he said. A statement from the US Embassy said: "The US Embassy in London conscientiously abides by all UK laws, including paying fines for all traffic violations, such as parking and speeding violations. "Our position on the direct tax established by Transport for London in 2003, more commonly known as the congestion charge, is based on the 1960 Vienna Convention on Diplomatic Relations, which prohibits the direct taxation of diplomatic missions. "Our position is wholly in accordance with that agreement to which the United States and the United Kingdom are both signatories, and it is a position shared by many other diplomatic missions in London." A spokesman for TfL said: "Around two thirds of embassies in London do pay the charge, but there remains a stubborn minority who refuse to do so, despite our representations through diplomatic channels".